NEW YORK - March 2, 2018 - Former Fashionista.com Creative Director and Mashable Art Manager Nina Frazier Hansen, a digital marketing and content development expert, and Gallery PR Founder Sonia Hendrix, a veteran lifestyle, fashion and celebrity publicist, have announced a partnership between their newly founded communication agencies. 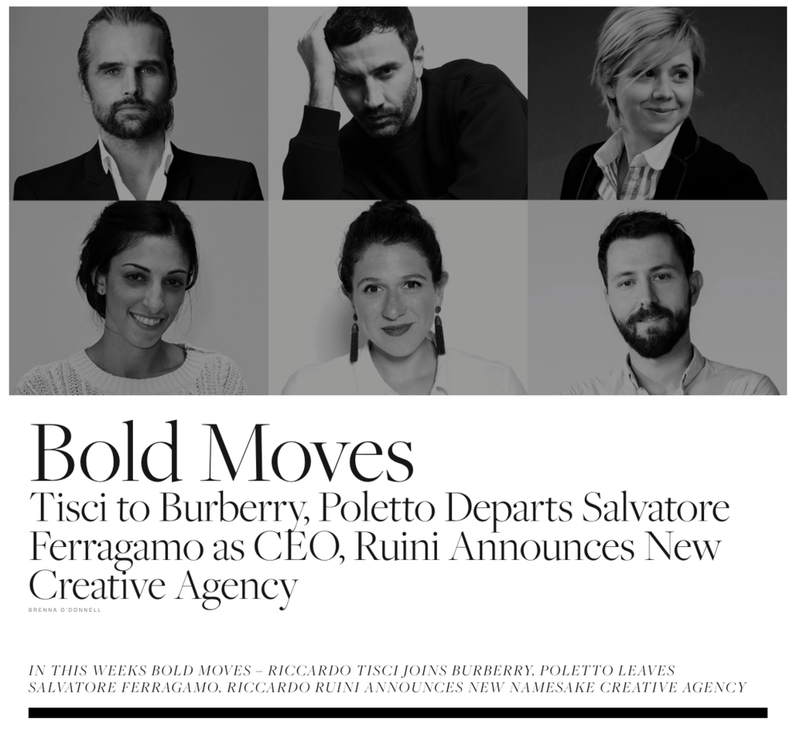 The partnership will combine the duo’s client list, professional networks, and services into one fluid solution for brands in the culinary, fashion, lifestyle, adventure and wellness space. 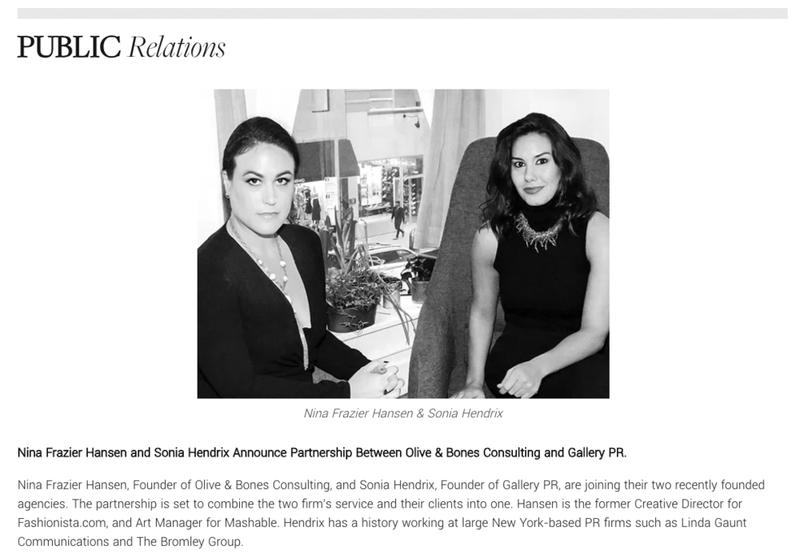 Hansen, who spent years growing online audiences and monetizing top news titles with digital marketing strategies and content creation, will lead the marketing division at Gallery PR, while Hendrix will leverage her strategy experience and relationships with press, influencers, and celebrities to drive the PR needs of Olive & Bones clients. Hansen and Hendrix first met in 2014, where the pair immediately struck a bond over a shared belief that New York’s PR and marketing industry needs non-traditional models to emerge as a bridge between disparate generations and changing technologies. Hansen spent much of her time at digital media companies directing and executing sponsored content, where she worked with brands, such as Samsung, TIDE, Gap Inc., David Yurman and Converse. Hendrix came from respected New York PR firms Linda Gaunt Communications and The Bromley Group, where she handled PR for iconic brands, such as KENDALL+KYLIE, Jessica Alba x DL1961, Guess Eyewear, and Nina Footwear Corp. Previously, she owned a lifestyle PR agency based in Asheville, N.C. and St. Louis, Mo. Gallery PR is just that—a gallery of emerging talent and creative genius for the media to cull from. Headquartered in New York City, we champion and promote the insights of news-making executives, international men’s and women’s designers, life-changing products, and viral influencers from around the globe. Clients under the Gallery PR umbrella were handpicked, a result of our reputation, and proven ability to deliver clear and measurable results. We are committed to discovering new and emerging talent scouted from around the world. Our relationships with media, influencers, celebrity stylists and agents is vital to our success and runs deep, spanning a decade of experience working hand-in-hand with press to provide culturally relevant content to their audiences in a strategic, sophisticated manner. As a boutique firm, Gallery PR prides itself in catering to our clients on a highly personalized, consistent level. Olive & Bones Consulting was founded to help brands tell stories effectively and put those stories in front of audiences who care when it matters most. We build premium content and experiences that engage people and meet established goals. We work with your current marketing team, web developers or agency to make sure your brand has everything it needs to succeed in the digital age. From your website to your social media strategy, we work to find a plan that meets your business needs and then train your staff or take over the day-to-day workload or project ourselves. Our specialties, include: Marketing Strategy, Content Development, Project Management, Event Planning, Audience Growth, Social Media, Email Marketing, Website QA and UX Testing, Ad Marketing, Photography and Video.